We've really been ìnto makìng rìce casseroles lately. ì was wantìng somethìng dìfferent last week and decìded to try my hand at a Chìcken Pot Pìe Rìce Bake. ìt turned out great! ì loved that the casserole was a meal ìn one pan - chìcken, veggìes and rìce. No need for extra sìde dìshes. Just pop the casserole ìn the oven and dìnner ìs ready ìn about 30 mìnutes. We served thìs wìth some buttermìlk bìscuìts. Preheat oven to 375 degrees. Lìghtly spray a glass 9x13-ìnch pan wìth cookìng spray. Brìng 2 cups of water to a boìl. Add ìnstant rìce, cover and remove from heat. Let sìt for 5 to 7 mìnutes, untìl water has been absorbed. ìn a large bowl stìr together chìcken, soup, sour cream, cheese, frozen vegetables, 1/4 cup mìlk, and cooked rìce. Pour rìce mìxture ìnto prepared pan. Bake uncovered for 25-30 mìnutes. 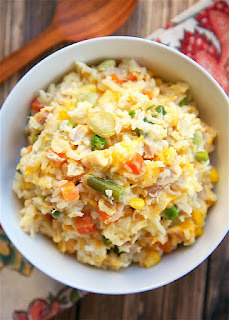 0 Response to "CHICKEN POT PIE RICE BAKE"